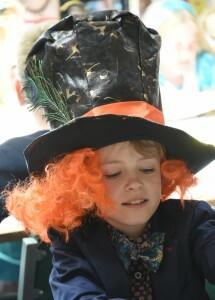 On Monday 29th June, the Prep School had a day full of Alice in Wonderland. For the Prefects Charity Day pupils were invited to dress to meet the Alice theme! There was also a themed Tea Party as part of the Library book club, at which over 60 pupils, from Year 3 to 6 attended, ate some truly wonderful cakes which had enticing messages, and answered questions in the Mad Hatter’s Quiz. The White Rabbit made a very late appearance… There was a dormouse librarian, who unfortunately kept falling asleep. The pupils over the last few weeks have been enjoying a range of Alice themed activities – from maths lessons featuring Alice in Numberland, to entering a short story competition in which they were invited to describe their idea of Wonderland. 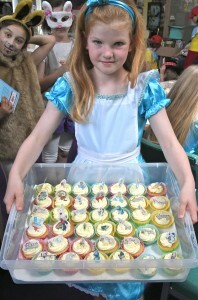 As this is the 150th anniversary of Lewis Carrol’s children’s classic, it was the perfect theme to celebrate the end of term for the Prep School who have all worked so hard this year. The Sixth Bishop’s Stortford College Festival of Literature was another fabulous event. With guests ranging from the controversial David Starkey, to the coastal adventurer Nicholas Crane and political columnist Steve Richards, there was something for everyone to enjoy. The 2015 Bishop’s Stortford Picture Book Award was also part of the Festival of Literature. Fifteen local primary and secondary schools cast over 1900 votes to pick the 2015 winner out of a shortlist of nine titles. “Oi Frog” written by Kes Gray and illustrated by Jim Field was this year’s worthy winner and was the clear favourite in seven of the voting schools. Kes’ funny, fast paced rhyming book had pupils in fits of laughter as he read it aloud. Cats sit on mats, pumas sit on satsumas and, before he left the stage, he revealed a Kes sits on his Fez to much amusement! In second place, which was clearly a secondary school favourite, was Chris Haughton’s “Shh! We have a Plan”, and in third place was Alex T Smith’s “Foxy and Egg”. Award winning illustrator Nick Sharratt hosted the event and the College were delighted Peter Bentley, Kes Gray, James Mayhew and Richard Byrne were able to attend the award ceremony along with 200 pupils from the College and local schools who had voted. Bishop’s Stortford College’s resident cartoonist Simon Bailey presented his unique College adaptation of Kes’s “Oi Frog” at the end. This will be placed proudly on display in the Prep School library. The College also joined in the first ever Harry Potter Book Night as part of the Festival where the Prep School could celebrate everything Potter. Prep School Pupils received their invitations by owl post which caused great initial excitement. After being grouped into Hogwarts houses by wearing the Sorting Hat, Harry Potter themed games, including a version of Quidditch, earned all the pupils house points. Wizarding Snacks and Pumpkin Juice was followed by a quiz and the winning House, Slytherin, was awarded an Owl trophy. The hall had been fantastically decorated in true Hogwart’s style; pupils could even pop by Ollivanders for a new wand or visit Gringott’s Bank for some chocolate coins! A fantastic time was had by all. Are you up for a summer reading challenge? 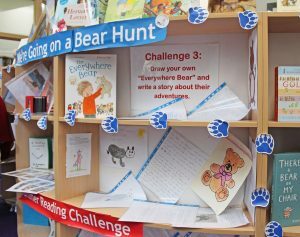 Kathryn Houghton, librarian at Bancroft’s School in Woodford Green, created this wonderful summer reading challenge to get her Prep pupils through the long summer holidays. This would also work perfectly as a transition project between Year 6 and Year 7. The challenges are innovative and fun, and she has given me permission to reproduce her booklet here so that you can be inspired as well. The original was in a Publisher booklet, so converting to pdf has muddled up the order of the pages – so please ignore that and just enjoy the challenge! 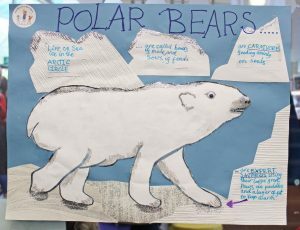 Have you been celebrating National Share a Story Month in your school? If so, please send me what has been happening in your own school. Have a look at the wonderful things that have been going on at Bishop’s Stortford College. 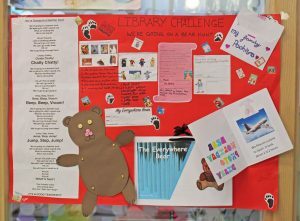 ‘The Prep School Library at Bishop’s Stortford College is celebrating National Share a Story Month with a Dragon theme. The library displays have embraced this mythical theme and Library lessons have focused on how dragons have been represented in stories, poetry and in art throughout the ages. A Dragon app that revealed dragons flying around the library was especially popular. “This project has been achieved with the help of a donation from the Friends, allowing the acquisition of book benches and colourful exterior bean bags and seating. Inspired by the National Literacy Trust’s book bench project in London we were able to buy two blank book benches. 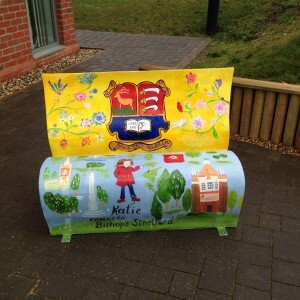 Author and illustrator of the Katie books, James Mayhew, who also created a ‘Katie in London’ bench for the ‘Books about Town’, joined Prep School pupils in the art room to help create a special ‘Katie in Bishop’s Stortford’ bench, painted by the pupils, and another inspired by the theme of gardens in children’s books. 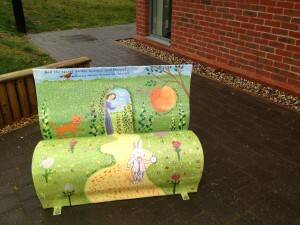 Pupils had previously engaged in a competition to design the two benches and the winners of this competition contributed to the final painting of them. The College is extremely grateful to the Prep School Friends and James for making this fantastic project possible. The Prep School Librarian Rosie Pike said, “It was a thrilling day for all involved. Seeing how the benches developed during the course of the day was amazing, and an idea of the fun that was had can be seen in this time lapse video. 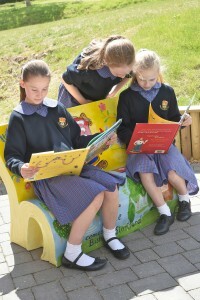 If you would like to purchase one of these book benches, they can be backordered from the Wild in Art website. Contact Joy Young, and she will be able to help you.